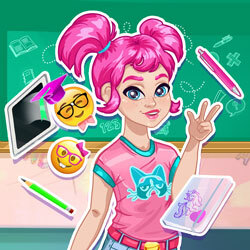 Description: Moody Ally is excited to go back to school, but she needs your help! Put your creativity to work and arrange her desk, hang posters and streamers on the walls and decorate the desk. After that, get her ready and choose the right outfit for her on her first day of school.